Stay in a friendly atmosphere in our holiday house, Lakaz lor Ros (Licence n° 07300 delivered by Mauritius Tourism Promotion Authority). The house can accomodate up to 5 people (2 rooms on the 1st floor, and 1 downstairs with it's own bathroom, all air-conditionned). Select the west coast, which offers the best climate of the island, and keeps its identity. The house has simple modern style, wide and light-through-flooded. Ideal if you look for a peaceful place and a pleasant garden with tropical fruit-trees. The house is settled in a green residential plot. Because it's our own vacation house, we planned it with an European comfort and mauritian way of life. We renew and improve regularly the equipment and pay a particular attention to the maintenance. During your stay you will have the services of an employee for the household. Bedlinen and towels are supplied. Your programm : relaxing in the shade or bathing on the beautiful beach with pure sand, that you can reach in 5 minutes on foot. There are numerous tourist activities within half an hour by car. In the evening : a magical, romantic sunset on the Indian Ocean ! Simply sit down on the terrace and listen to the concert of multicolored birds. Your local correspondant will pick you at the airport. You can ask him to guide you in the Island. You will get special conditions for renting a car through our local partner. I'm French, married with Georges, French-Mauritian living in France for 40 years. He kept his Mauritian roots, staying several times a year in Mauritus. He was a building worker. Recently retired, he spends lot of time undertaking the maintenance of our house, while I take care of the rental of the house. The owner had this house built during 90s for the holidays of his family and to stay when he would be retired. He guessed the development of this region, wich opens to tourism. One independant toilet downstairs. One bathroom ensuite downstairs One bathroom with toilet and bath on the 1st floor. "We were very happy at your vacation home. It was a great place to relax. It was very quiet and peaceful. The couple who took care of the house wanted to help us every manner. They even cooked us a local meal. It was clear that they wanted to make sure that they did their utmost best. You are lucky to have such nice people taking care of your house. Please convey our appreciation to them. 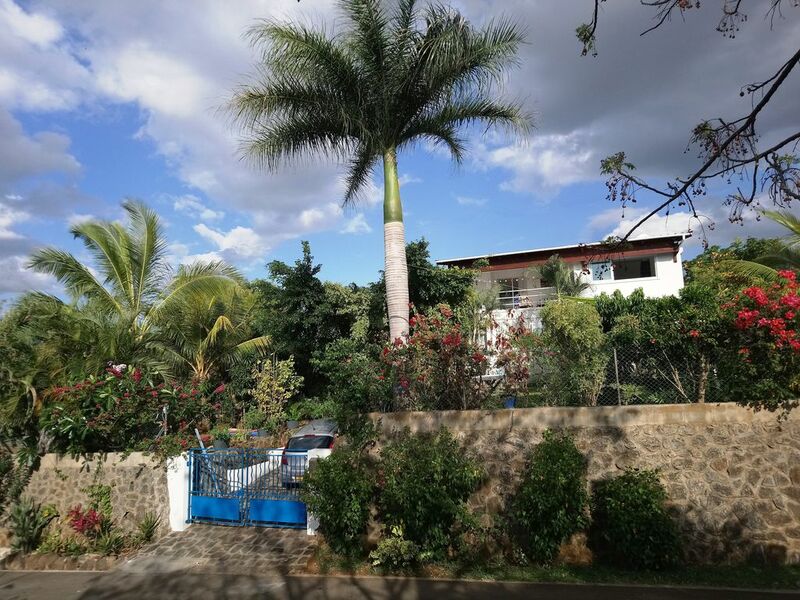 We recommend your nice house to anyone who wants to visit Mauritius. We have already told our friends about this house and the environment." "The house was beautifully clean and well equipped. There were even games for the children!It was very welcoming and we felt very happy and at home there. We were welcomed with a delicious, freshly cooked, Creole meal when we first arrived. There is a local shop just down the road where you can get most things, and the surroundings were very quiet and friendly. I stayed there for three weeks with our three children aged between 5 and 12 years and we had a wonderful time. The beach was not quite as close as we had been led to believe by the Homelidays information, but it is only a short walk away. This was our first taste of Mauritius and we certaily want to return!! Thank you." Je recommande cette location qui a répondu en tout point à nos attentes. La maison est très propre, étage récent et très agréable au milieu de la verdure. La clim marche bien dans les chambres et le nécessaire de cuisine est présent. Propriétaire et personnel sur place sont charmants et contribuent à la qualité du séjour. Sinon séjour très agréable ! Merci. Excellentes vacances dans une cadre idyllique ! Nous avons passé de superbes vacances à la résidence Lakaz Lor Ros. La villa est tout confort, il ne manque vraiment rien pour passer de délicieux moments. Elle est située à seulement cinq petites minutes à pied de la plage. Que ce soit au niveau de literie, des équipements et de l'agencement, tout est fonctionnel et fait pour passer de très bons moments. Mention spéciale à la varangue au rez-de-chaussée, et à la terrasse à l'étage ! Je recommande vivement cette location. Merci beaucoup pour cette évaluation élogieuse, nous sommes ravis que la maison vous ait permis de passer un agréable séjour. Ce fut un plaisir d'accueillir votre famille. Une villa spacieuse, très bien équipée, très propre, au calme et à moins de 10 minutes à pied de toutes les commodités pour vos courses. Vous ne pourrez qu'être séduits, comme nous l'avons été. Vous apprécierez également la terrasse sur le jardin pour vos petits déjeuners, en admirant le ballet des oiseaux multicolores de l'île (cardinal, serin du Cap, bengali, ...). Le service et le ménage sont irréprochables et toujours prêts pour une petite attention afin de rendre votre séjour inoubliable. Nous vous remercions vivement de ce commentaire élogieux. Cela nous encourage à continuer à faire de notre mieux pour la réussite des vacances de nos locataires. Upon reservation we organize your receipt at the airport and, if you wish, renting a car. The house is approximately 40 minutes from the airport, 30 minutes from the capital and 15 minutes from the next commercial town. There are numerous offers of trips and leisure activities on the island. We have everything, to please all guests (sports, big game fishing, Kreol, Indian or Chinese gastronomy, tropical, museum, culture, tropical nature, activity parks, music…) and we will give you good addresses. But the first wealth of Maurice is the cordialness of the mauritian receipt, which will leave best memories to the vacation.